Just came back from watching Happy Feet. It's ADORABLE! First of all, the animations are amazing, really....sometimes, you even forget it's animated. That's how good the animations are! The music is great, and makes you want to get up in the middle of the theater and start dancing. And the actors do a great job with the voices...Hugh Jackman, Nicole Kidman and Brittany Murphy all sing their own songs in the movie. Elijah Wood does a really good job with the voice for the main penguin role. Initially, Prince refused to allow the use of his song, "Kiss", for the film. However, after seeing footage of the film, he not only changed his mind and allowed the song to be used, but also wrote an additional original song for the film to use in the closing credits. So, if you have nothing to do this New Year/Eid holiday, go watch Happy Feet...fun for the whole family! Click here to check out the Happy Feet website. 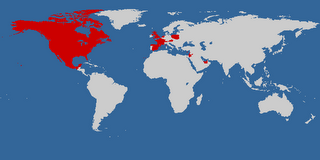 Create your own visited country map, by clicking here. Here's a picture of one of our Christmas ornaments. I love macro photography. Merry Christmas once again... I hope Santa was generous this year (he was with me!) and that you enjoy the day with all your loved ones. I am now officially on vacation...until next year! 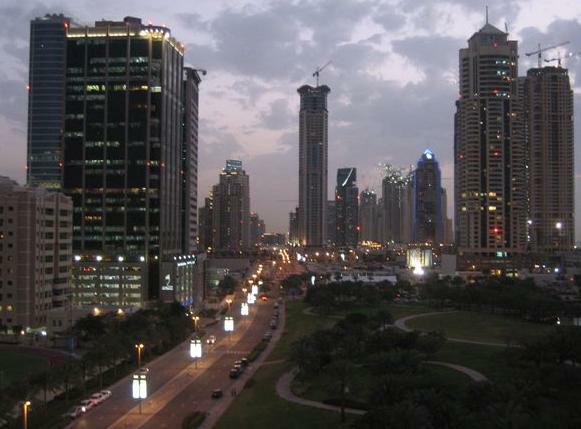 Nothing too exciting...I'll be spending most of it in Abu Dhabi with la familia. I am already bored, so I really don't know how this next week will go, especially given that both my sis and my bro will be working (except for Christmas day). And I don't have that many friends here in A-D....so I guess I'm going to have to keep myself entertained. - First, 2 days of Christmas shopping. 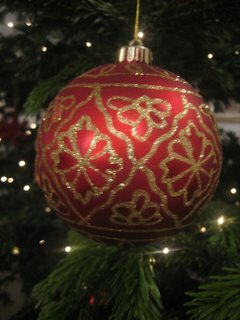 I have not bought a single present yet, so tomorrow and the day after will be dedicated to shopping. - I also have a lot of movies and series to catch up on: I started watching episodes 1-6 of season 3 of Lost, I am hoping to be able to download episodes 1-10 of season 3 of Grey's Anatomy, I have downloaded copies of Volver, Babel and the new Bond, I want to try to catch Holidays at the movies, and I have yet to finish season 4 of 24 (I just got sick of 24 after a while, so I just stopped....but maybe I'll get back to it soon). The name of the 7th and final Harry Potter book has been revealed. I'm not a die-hard Harry fan, I've only read the 1st book, and I have seen 2 (or maybe 3? Don't remember) of the movies. Here's the first hint: click on the eraser....and then....well, I'll leave it up to you to discover the rest. You need to click around the the page to reveal items, one after the other. If all else fails, the clues (and the name of new book) can be found here. Now the question is, what days are going to be declared off? Hmm...been feeling sick the past couple of days. I left work early yesterday, couldn't sleep all night, went to work this morning despite feeling like I had just gotten hit by a bus, and now, I am sitting on my couch, with a sweater, and a thick blanket, and yet I'm still freezing cold (oh, and the A/C is off, and the window is closed). I thought I had a fever, but the thermometer says my temperature is normal. But I am definitely not feeling right. I think I just need a good rest, but tomorrow is my last day at work before the holidays...So I am kind of forced to go to work to hand-over all my projects. We'll see how I feel in the morning. The last thing I want is to spend my first few days off sick in bed! Plus, I have a ton of shopping to do. Ever the procrastinator, I have not bought a single Christmas present yet! I was counting on this weekend to get all my shopping done! Ugh...the thought of scouring the busy malls for endless hours trying to find the perfect gift makes me sick to my stomach, but I gotta do it! I admire people who are disciplined enough to get some of their Christmas shopping done a couple of months before, or even in the summer! Plus, I can't hold on to a gift for a couple of months. If I buy someone a gift, I have to give it to them immediately! Change of topic: I noticed that beta blogger is now no longer beta. I don't know why, I am still reluctant to switch over to the new blogger. To all those who have already switched, what's your feedback so far? Are you happy with the change? Do you recommend it? Has it made blogging easier? When will Eid al Adha fall this year? While it's never clear when Eid falls, this year, the issue is of particular interest to those who feel like clubbing and celebrating on the night of the 31st. If Eid falls on the 1st on January, then New Year's Eve is considered a "dry night", meaning no alcohol is to be served in clubs. If, however, Eid falls on the 31st of December, then the "dry night" is on December 30th. According to this report, a decision will be made within the next seven days....and yet, in the same report, it's mentioned that when Eid will fall will "depend on the moon"....so how can a decision be made within 7 days then? My bet is that Eid will conveniently fall on December 31st, to ensure that the 31st is not a dry night, in order to avoid depriving hotels and clubs (and the economy) of cashing in on what's probably considered THE night of the year to them. That being said, why is New Year's such a big deal anyway. Why does the 31st of December have to be the night for people to go all out? Why can't they do the same thing any other night of the year? I just don't understand why someone would pay 4-5 times the price of a regular night out, to go to a place where they'll end up doing the same thing they'd do on any other regular night out (listening to the same music, partying with the same people, having the same drinks, etc...). New Year's is so overrated! Dubai Police said that the accident happened before 7am after a bus heading in the direction of Dubai lost control. The bus then turned over, crashed through the central reservation barrier and into oncoming traffic on the Abu Dhabi bound carriageway. The minivan, which was travelling towards Abu Dhabi then crashed into the overturned bus. What's with the rain lately? It has rained more in the past couple of weeks than it has all of last year (and maybe even the last 2 years combined!). Not very exciting, I know, but I'm looking forward to some relaxing, stay-at-home and watch movies-and-not-have-to-worry-about-work time. 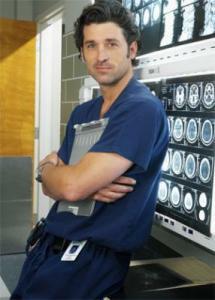 Patrick Dempsey plays Dr Derek Shepherd (also known as Dr McDreamy) on Grey's Anatomy...and he is really hot! I have recently been hooked on the show (not just because of Patrick...it's a really good show), which revolves around the lives of a group of first-year surgery residents. Have any of you seen the road safety campaign that's been airing on TV lately? I've only seen one spot on One Tv, not sure if there's more than one. It's the one where a teenager standing on the side of a road talks about a head-on collision involving his parents....then we see two cars coming from opposite ends of the road crashing violently. The final message is: "Speeders...they're killing us. Think!" While I commend TV stations for finally airing something about road safety, I feel that this is simply not relevant to the UAE. For one, this is a UK-based campaign I believe (although the accents sound like they're from Australia or New Zealand). The actors look foreign, the road (a 2-way winding road with lush greenery on either side) is simply not the kind of road we see here in the UAE, and they are driving on the left-hand side of the road, rather than the right, like we do here. And although I do not watch a lot of Arabic TV stations, I doubt that this campaign would be successful if it were dubbed. I'd rather see something that's produced locally, using our roads, our people, our language. Now THAT, I believe, would be a much more successful and impactful campaign, don't you think? This year again, the national day holiday is not unified across the public and private sectors. National Day this year falls on a Saturday, which has officially become the weekend for all public sector employees just a couple of months ago. The public sector is therefore getting Sunday off. Some (very few) private sector companies have decided to give their employees Sunday off as well. Most private sector companies are functioning normally on Sunday. Why is there still this discrepancy. Why can't holidays be unified. Why can't the government agree that if a holiday falls on a weekend, we get an extra weekday off to compensate (i.e. if a holiday falls on a Saturday, we get the Sunday off too!). 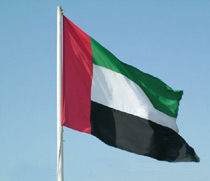 Anyway, happy National Day to all...the United Arab Emirates are celebrating their 35th birthday by the way!